Ally Ellison, Director of Media for Westar Associates, recently presented a check for $5,000 to Scott Macdonald, Captain Steve Concialdi, Bob Embree, and Scott Hawkins of the OCFA. 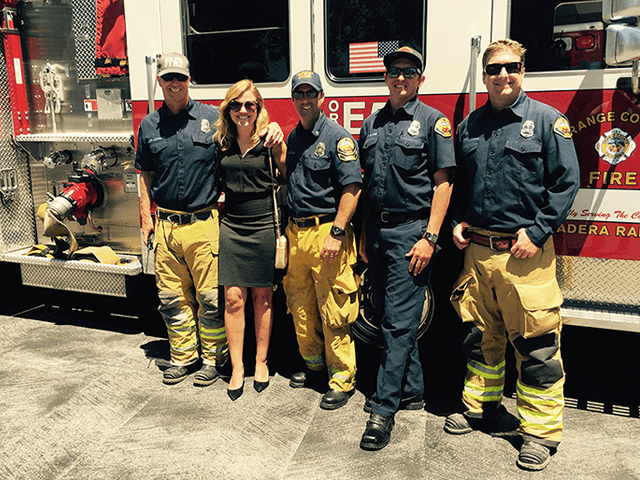 Costa Mesa, CA, August 31, 2016 – Westar Associates, an Orange County real estate development and management company, has donated $5,000 to the Orange County Fire Authority Department Benevolent Association. The OCFA Benevolent Association provides physical, financial, and emotional support to its members and their families during times of need. Their support and services can include hardship loans and grants, funeral assistance, death benefits, scholarships, and other assistance. The company also recently donated $10,000 to the Orange County Sheriff’s Department. Based in Costa Mesa, California, Westar Associates is engaged in the acquisition, development and management of real estate including neighborhood, community, and freeway shopping centers, apartments, self-storage facilities, and hotels. Westar has developed and acquired 55 properties totaling more than 5.6 million square feet, valued in excess of $1.2 billion.